from my beachfront condominium rental’s lanai (or porch) is truly exceptional. It’s the reason I bought this Maui Hawaii Condo Rental on Kaanapali (Ka’anapali) Beach. We’re perched high on top of The Whaler Condominiums – on the 10th floor of 12 – far above the bustle of the beach. Did you look at the Video above? Imagine yourself sitting on a chair on our lanai. Much of what you see in the video is what you would see sitting on that chair. 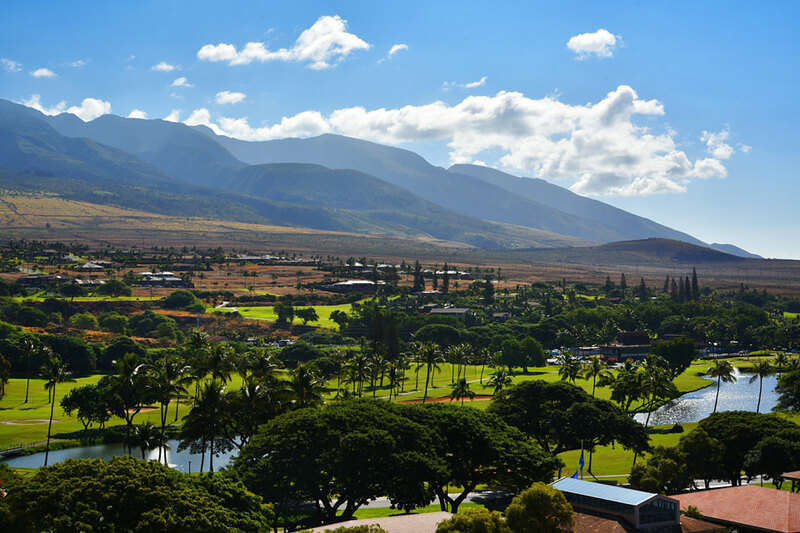 You would see-the sparkling sea, a vast beckoning beach in front of you, the lush green mountain range, a golf course to your left, with the island of Lanai and the old whaling port of Lahaina, Hawaii in the distance. Guests tell me they spend hours on the lanai relaxing in our chairs just watching the changing light, from sunrise to sunset. Visualize yourself basking in the warmth of the sun and taking in some of the most beautiful scenery in the world. 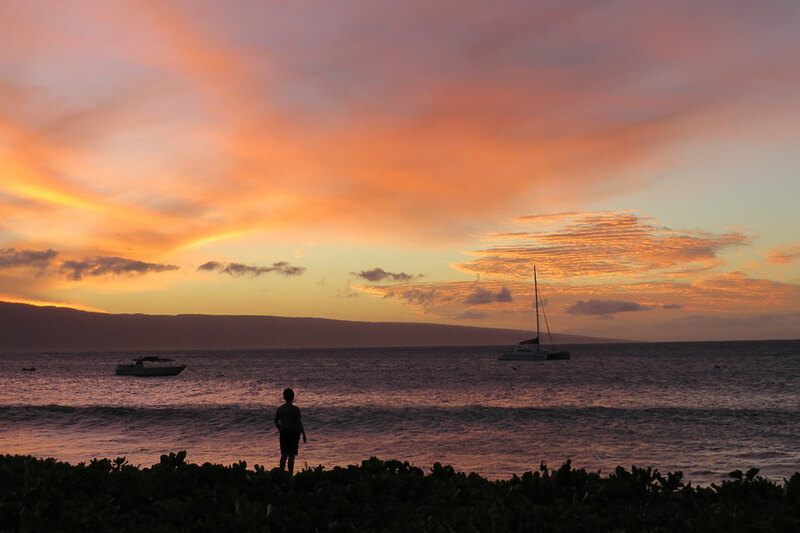 Look up and see the mountains bathed in orange and the island of Lanai draped in low-hanging clouds. Look down and see a tremendous splash breaking the glassy surface of the sea: a majestic humpback whale, breaching close to shore. 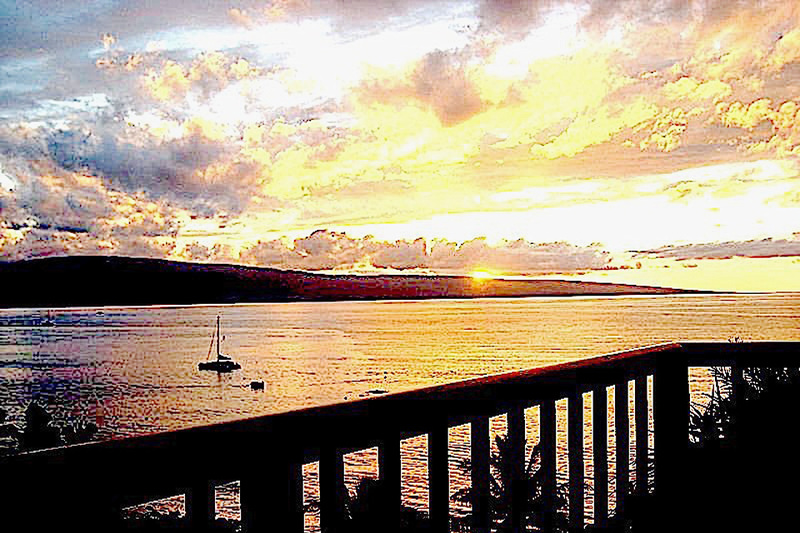 Later that evening, take advantage of an ideal romantic setting and share a Hawaiian pupu (an appetizer plate of local goodies like tempura vegetables and skewers of chicken and fish) on your lanai, and watch the lights of the old Lahaina whaling port glimmer in the distance as the sun sinks into the Pacific. 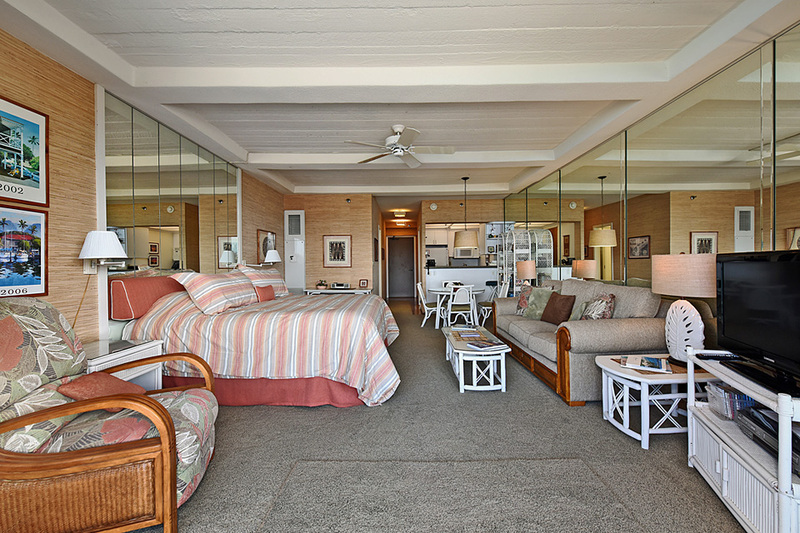 This is paradise, a Maui Getaway, and one example of what awaits you at Whaler 1063 Maui Condo Rentals. Our large studio condo (640 sq. ft) with King-sized bed is intimate, comfortable, and has everything you need close at hand, including kitchen supplies and a collection of beach goodies like lounge chairs, a beach umbrella, snorkeling equipment, boogie boards and a picnic cooler. We also provide a television and DVD player, wireless Internet, an étagère with Hawaiian artifacts and a small library of books. For adventurers ready to explore, there are dozens of options nearby, including some of the best snorkeling and scuba diving on Maui, helicopter tours, golf courses, ferry, bicycle trips down Haleakala, horseback riding in the upcountry, a winery, luaus, and moonlight dinner cruises leaving from Kaanapali Beach. You won’t want to leave Hawaii. You can reserve dates up to December 31, 2020. ©2019 Whaler 1063 Condo Rentals, Lahaina, Hawaii – All Rights Reserved.